WASHINGTON, DC – In a scathing attack on the Trump administration’s immigration policies, Democratic leaders in the House of Representatives have called them xenophobic, abhorrent, un-American, and have pledged to protect the human rights of those seeking refuge and asylum in the US. A congressional briefing titled “Detentions, Hunger Strikes, Deported to Death,” held Tuesday on Capitol Hill, highlighted the horrors faced by civil immigration detainees under Trump who has made reshaping the US immigration system a top priority. The event was hosted by South Asian Americans Leading Together (SAALT), an outstanding advocacy organization always in the forefront when it comes to pressing issues impacting the community, in partnership with immigrant justice groups. Citing “hunger strikes, attempted suicides, lack of access to medical care by immigrant detainees,” Congresswoman Judy Chu commended “SAALT for putting together this briefing to highlight what is going on and how diverse communities are impacted by the xenophobic policies of the Trump administration and our broken immigration and detention system. Over the past few years, we have seen a spike in the number of individuals seeking asylum from India, Bangladesh, Pakistan and Nepal who have suffered from neglect and abuse at the hands of our own federal government. This is unacceptable,” she said. The California Democrat recalled her visit to the Victorville Federal Correctional Complex in her home state last year in August when she was appalled by the “horrifying conditions” of the asylees. “Most of the detainees at Victorville federal prison were South Asians including a number of Punjabis – Sikhs,” she noted. As chair of the Congressional Asian Pacific American Caucus (CAPAC), Chu pledged to continue working with fellow legislators “to push for greater transparency, accountability, and oversight” at detention facilities operated by Immigration and Customs Enforcement (ICE). Earlier this year, shocking reports emerged from a Texas detention center where nine Sikh immigrants from India on a hunger strike were being force-fed via nasal tubes. Following public pressure, ICE was forced to halt the practice at the El Paso Processing Center. The United Nations human rights office stated that such force-feeding could violate the UN Convention Against Torture. The Indian detainees were using the method of hunger strikes to peacefully protest conditions that they were subjected to such as solitary confinement, verbal abuse, lack of medical treatment, disregard for religious accommodation, and other discriminatory practices. Last year, it was revealed that 52 Indian nationals, among 123 men, were held by ICE at a federal prison in Oregon without any meaningful legal access which is in violation of the US Constitution, federal immigration laws and international treaties. The civil immigration detainees were treated like criminals, confined inside the Federal Correctional Institution in Sheridan for upwards of 23 hours a day. Three men were bunked in each cell as the facility does not have adequate resources to house ICE detainees along with the pre-trial inmates who are normally held there. At the Capitol Hill briefing, Suzanne Bonamici who represents the congressional district housing the Sheridan prison bemoaned, “Far too often, I hear from Americans who are horrified by the Trump administration’s treatment of people seeking safety at our border. I am grateful to South Asian Americans Leading Together and others for bringing continued attention to the Trump administration’s terrible detention and enforcement policies,” she said. The Democratic lawmaker told the audience, “I saw firsthand how these policies are hurting people when I visited detainees at a federal prison in Sheridan, Oregon. We must do everything we can to protect the human rights of every individual,” she emphasized. Upon learning of the hunger strikes in El Paso, Bonamici joined fellow Democrat Veronica Escobar whose congressional district includes the border city in west Texas to call “for an investigation of the conditions at ICE detention facilities. My colleagues and I will continue pushing for strong oversight that holds this administration accountable for its appalling treatment of those seeking refuge and asylum,” she vowed. Democratic lawmaker Grace Meng who represents one of the country’s most diverse districts in Queens, New York, lambasted the Trump administration for its xenophobic immigration policies. “This president has made the targeting of immigrants a central part of his administration’s policies while persistently lobbing bigoted, verbal attacks at immigrant communities,” she said. Underscoring that Trump “has instructed immigration enforcement agencies to carry out inhumane practices,” Meng mentioned some of the “abhorrent” actions such as throwing nine Sikh asylum seekers “in solitary confinement for just protesting peacefully” in El Paso, feeding only pork sandwiches to a Muslim detainee, separating children from their parents, and conducting immigration arrests at sensitive locations like courthouses and schools. “The lack of empathy for these immigrants whether they are from Guatemala, India, Vietnam, any country, is not just un-American, but it is an affront to our humanity,” she said. “As a member of the House Appropriations Subcommittee on Homeland Security, I will continue to hold President Trump and his administration accountable for the immigration policies that they have implemented,” she pledged. “We have to continue to work together as Americans to overcome this fear-mongering and stand up for the ideals that make our nation the greatest in the world,” Meng told the gathering at the briefing. “Diversity and collaboration of cultures has always been our strength,” she added. Congresswoman Karen Bass (Democrat-California) who chairs the Congressional Black Caucus was very vocal in condemning what she called the “outrageous” immigration policy of the Trump administration. “We are in an unbelievable time period in our history” when “we have to hold this administration accountable for every aspect of immigration,” she said citing Islamophobia and kidnaping of children at the border. On hand at the briefing were expert community leaders and advocates who highlighted abuses and civil rights violations documented in detention facilities from Adelanto, CA, to El Paso, TX, citing cases of medical neglect, inadequate language access, denial of religious accommodations, retaliation for hunger strikes, and the practice of solitary confinement. Among the panelists were: Deep Singh, executive director of Jakara Movement; Ruby Kaur, an attorney for two of the El Paso detainees; Patrice Lawrence, National Policy Director of UndocuBlack Network; Sanaa Abrar, Advocacy Director of United We Dream; Jennifer Apodaca of the Detained Migrant Solidarity Committee in El Paso; and Carlos Hidalgo, a member of Freedom for Immigrants leadership council. Deep Singh shared a somewhat different perspective declaring that “immigrant prisons are big business.” The system is “replacing profits over people and xenophobic spectacle over actual safety,” he said. “What is our humanity? What is the dignity that we are giving to all communities that are seeking asylum?” he queried. While describing the “appalling conditions in detention facilities,” Singh mentioned that detainees do not get a change of clothes for weeks on end, some with rotting teeth are denied access to dentists, and are charged for phone calls at the rate of $5 per minute. “This has nothing to do with a crisis at the border. This has to do with a means that we have perfected to extract profits from the most vulnerable populations,” he said. Ruby Kaur categorically stated that “detention is punishment.” Most of the time, detainees do not have the means to hire an attorney, and interpreters often do not use the correct terminology which weaken their case for asylum, she told the gathering. Lakshmi Sridaran, interim co-executive director of SAALT, stated at the outset that immigration is an issue that profoundly affects the South Asian, Black, Latino and LGBTQ communities. “It is the practice of solidarity and local organizing that we hope to uplift today for Capitol Hill to see, to understand immigrant detention, and to address the litany of violations and abuses faced by detained individuals,” she said. Among the immigrant justice groups who co-hosted the briefing with SAALT were: the Sikh Coalition; Sikh American Legal Defense and Education Fund (SALDEF); United We Dream; Detention Watch Network; UndocuBlack Network; and Freedom for Immigrants. 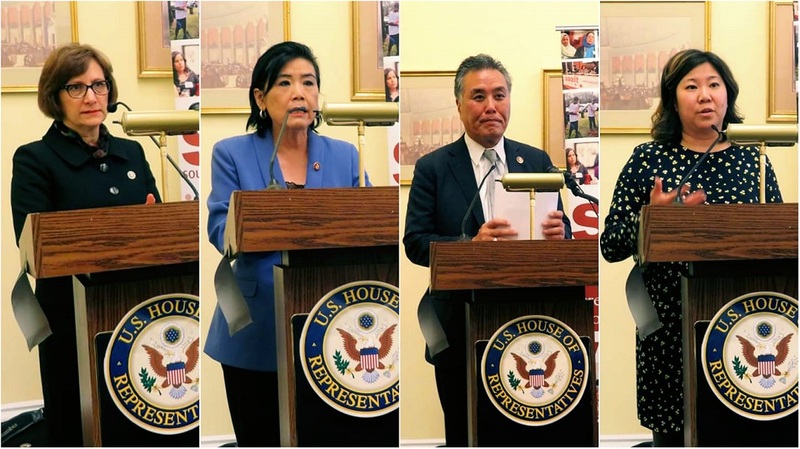 “I want to thank SAALT for its leadership in standing up for the South Asian community and I thank all the partner organizations that are fighting tirelessly for those who have been unjustly abused in detention facilities throughout the United States,” Congresswoman Meng said.